I've finally succumbed to the sickness sweeping the land, and find myself wide awake at 5am (this is not really a natural state for an astronomer). So, as I sit here with sore throat, a quick post for you. Blair Conn, my ex-student and now Humboldt Fellow in Heidelberg, and I, have had a paper accepted for publication in the Astrophysical Journal. The focus of the paper is the Monoceros Ring, a vast "stream" of stars that appears to circle at the outer edge of the Milky Way galaxy. The ring has had a bit of a checkered past, not its existence, but its origin. If you want to fire up astronomers (and scientists in general), start discussing the topics of research impact and research metrics. These are the buzz words at the moment, as governments around the world are carrying out assessment of research done with public funds. Here in Australia we are in the current round of The Excellence in Research for Australia, where research in universities is scored on a scale which compares it to international standards. I could write pages on attitudes to such exercises, and what it means, but I do note that the number of papers an academic has was a factor considered in a recent round of redundancies at the University of Sydney. 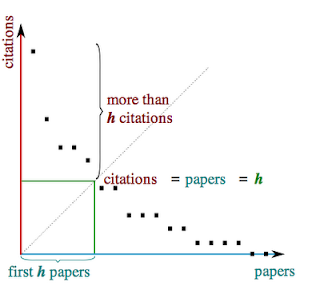 But what I will focus upon is an individual ranking, the h-index. Our office move has been completed, and I must admit that I am very pleased. The offices are swish, the french patisserie at the end of the street is superb, my walk to the trains has been cut in half, and I love my glass office wall/whiteboard. Time to get back to some work. And to kick things off, my PhD student, Tom McCavana, has gotten a paper accepted for publication in the Monthly Notices in the Royal Astronomical Society. It's a bit of a complex tale, but the underlying question is simple, namely how do galaxies grow over time?